In the middle ages, psalters were divided according to several traditions, each differing in number of divisions. The Shaftesbury Psalter has a ten-fold division. 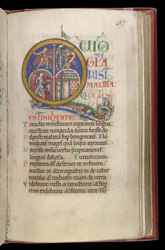 The first letter of each division has a picture (called a 'historiated initial'). The initial of Psalm 51 (52) ("Quid gloriaris", "Why do you boast") is divided into four parts, the upper ones showing David killing Goliath, who falls realistically with his bleeding wounds, and the lower David carrying Goliath's head to Saul's palace. A beautiful fire-breathing dragon forms the 'tail' of the 'Q'.